New book available on Kindle!!!!! I’m so excited to announce that my second novel is now available on kindle. It’s called Inflamed. I’ve kept with the theme of looking different and this time, the main character has psoriasis. It’s a coming-of-age story with a supernatural twist, which can be enjoyed by older children, teenagers and adults alike. When Megan’s family moves from the city to a small Welsh village, her life changes in ways she could never have imagined. Ever since she was small, Megan has suffered a disfiguring skin condition that takes a turn for the worse as terrifying dreams of fire rob the young girl of sleep. Megan finds she is losing control in more ways than one, and it seems she’s not the first child to suffer these nightmares and their dire consequences. Click here for a preview. 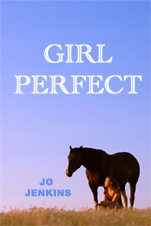 This is the web site for Jo Jenkins, author of GIRL PERFECT, a novel for older children and teens. Girl Perfect – want to read more? Biggest Smile in the World!